The stage door is a unique opportunity for theatergoers to meet and interact with actors from a Broadway show. After a show, most Broadway actors will exit out the stage door and sign autographs, chat with audience members, and take pictures, and it can be a wonderful experience, especially for visitors from out of town. It is important, however, to know what to do (and what not to do) at the stage door. Here are the 10 most important lessons I have learned over five years at the Broadway stage door. Be complimentary and appreciative – If you liked the show, let the actors know! Putting on 8 shows a week is tiring work, and they want to hear what you enjoyed about their show. Also, take a minute to thank the actors if they sign your Playbill or pose for a picture. It isn’t in their contract to sign every Playbill or take selfies with every audience member. Bring your own pen – Most Broadway actors will have their own pens at the stage door, but I always bring a Sharpie pen with me, just in case. If their pen runs out or breaks, they can still sign your Playbill, poster, or soundtrack. Always ask – Always ask when taking a picture or recording video at the stage door. The large majority of these actors love their fans, and they are more than willing to pose for a picture or record a video or audio message. Example: Bryan Cranston at the stage door of All the Way recorded a video message, asking an audience member’s girlfriend to prom. Have your camera ready – If you want a picture with one or more of the actors, make sure to have your camera or phone turned on and ready. Don’t make these actors wait around while you fumble with your picture settings, especially if they have a huge crowd of people waiting for a picture too. Give them space – Depending on the show and the stars in the show, some of the stage doors can get very crowded. Many of the theaters have security hired for handling the stage door crowds. If they ask you to move somewhere, pay attention and follow their instructions. Do not stand in the street, and be aware that you are not blocking off non-theatergoers who are trying to use the sidewalk. Bring the right kind of gift – Many fans like to bring gifts to the stage door, including fan art, letters, and picture collages. Some people, however, make the mistake of bringing homemade food like cookies or brownies. Is it a nice thought? Of course! Everyone loves cookies, but ask yourself if you would feel comfortable accepting homemade food from a total stranger on the streets of New York. Leave the cooking to the actors and their loving families, and stick to non-edible gifts. Don’t be shy – While you should certainly be aware of your surroundings and considerate of the actors and fellow theatergoers, do not be afraid to assert yourself and get your Playbill or poster in front of your favorite actor. If you want a picture, speak up and make sure they hear you. Don’t be a demanding jerk – Sometimes at the stage door, the actor has another engagement that night or the crowd is far too big to sign autographs for everyone. You might get an autograph and a picture, but maybe you won’t get either. Actors are humans, and acting is their work. Sometimes they have other commitments, and they can’t do anything about it, so don’t be rude by expecting something from them other than a great performance. Don’t denigrate other actors or shows – The Broadway community is a tight-knit one, and there is a big difference between telling an actor, “You should have won a Tony Award” and “You were so much better than ________.” Compliment the actors and their performances, but don’t do it at the expense of other actors or Broadway shows. Broadway is not Six Flags or Disney World – Matilda the Musical star Lesli Margherita was asked at the stage door if Miss Trunchbull would be coming out of the stage door in-costume. The answer is no. This is Broadway, not a theme park. The actors are coming out of the stage door because they are leaving the theater to go home, go out for dinner, or otherwise burn off the remaining adrenaline from the show. Their costumes stay in the theater. Readers, I want to hear from you! 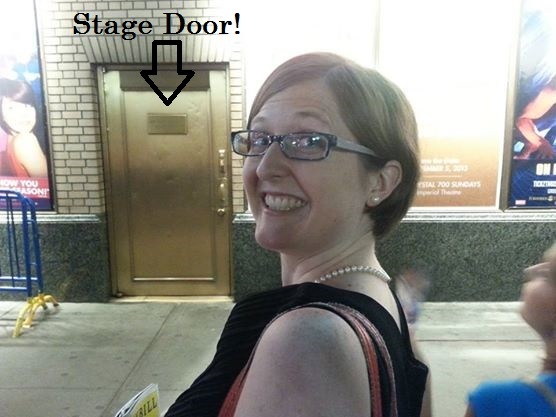 What was your favorite stage door experience? Leave a comment below, and connect with Ludus NYC on Facebook, Twitter, and YouTube for more Broadway news, reviews, and tips! I have been on both sides. I have stagedoored shows and I have walked out of the stagedoor. I knew people in shows and used to be in the Nut cracker. So being on both sides is great.